This thread needs to be revived, who's got what currently? That's a nice collection. On the other hand, I've been trying to rid myself of those that I simply do not play, even though they look great in group photos. Last edited by Ludgate; 11-16-2018 at 07:41 AM. So my awesome wife got me the Fishman Fluence Tosin Abasi non-soapbar 7-string pickups to put in my THIN-bodied Ibanez S7320 and the Fishman recommended superswitch from Stew-Mac (I'm sure you see where this is going). Of course, when my guitar tech went to install everything, the damn switch won't fit. In fact, it appears that NO aftermarket switch will really fit due to the way that the black plastic cover goes over the blade portion of the switch that sticks through the top of the guitar body. That being said, if I want to have the stock 5-way switch wired up and have the tonal choices that Tosin has, do you know which wiring diagram I can follow? 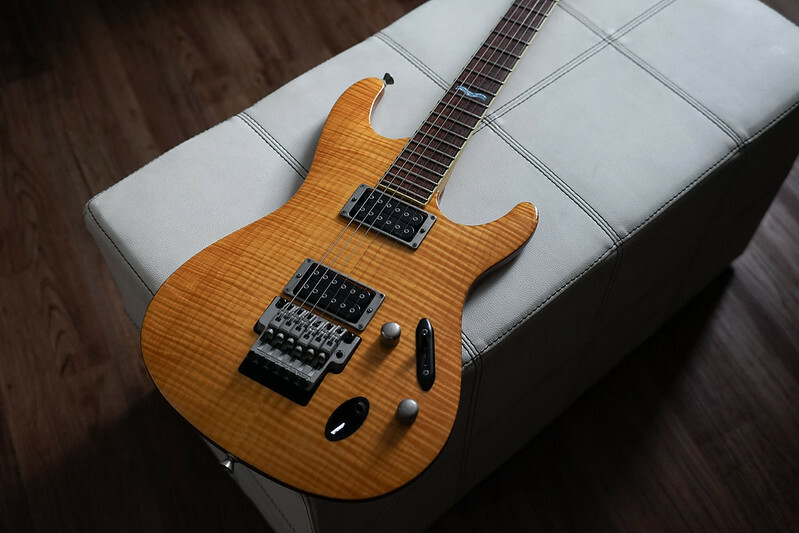 When I called Fishman, they said that I could use the Classic or Modern diagrams with the push pull pots to handle the coil tapping and such, but I didn't see anything that resembled a 5-way switch config that let me do that on their website pages. Just FYI should anyone care, the Tosin Abasi's will absolutely not fit within an Ibanez S7320 body unless you don't use the push-pull pots and only wire it with the stock switch... which sort of defeats the purpose of getting them. I am now having them put into my RG7621 and moving the Blackouts currently in that over to the 7320. Hope that may help someone prior to going through the pain and expense, themselves. Very psyched... my first Ibby is on the way! An '87 DY 540S. Unfortunately, it does have a crack in the neck at the nut that has been repaired. While I don't feel the need to immediately replace it, I have begun the search for a replacement. I did see a neck on the bay for a 1987 540R... I believe this is the same Wizard I neck... can someone confirm (I really love the feel of the original necks on these!)? I have a 1987 540R with an Ultra neck so there are no guarantees it's the same, a repaired crack around the locknut bolt holes isn't necessarily anything to worry about. I'll stand down and try to keep my paranoia at bay... while still keeping an eye out for my friend, Justin Case! Many thanks, sepulchrave! Unfortunately, it does have a crack in the neck at the nut that has been repaired. I'd like to see a picture of that before weighing in, but I have seen some of these over the years with small cracks up there that never amounted to anything more than cosmetics. Besides, we like pictures anyway. I got my first S a few months ago, really nice guitar, wish I had tried one sooner. I wish they'd offered the 24 frets sooner. Wanted one from the first time I picked one up, but the 22 fret thing held me off for a long time. First time poster in the S thread and also a first time S series owner. 1996/7 Ibanez S540FM it is. Beautiful guitar, sounds awesome! However, the previous owner didn't play it much lately so I have to do the setup. Long story short, I open up the truss rod cover and to my surprise, it's a Gibson style truss rod nut, meaning I have to buy a tool to adjust the neck. Can someone tell me, before I waste money trying various sizes online, what is the correct size tool for truss rod adjustment on this model? EDIT: Picture was too large, also first post! Last edited by Ivan Horvat; 03-06-2019 at 12:34 PM.